KENNEDY SPACE CENTER, Fla. –The U.S. Astronaut Hall of Fame will induct two new astronauts on April 21, 2018. 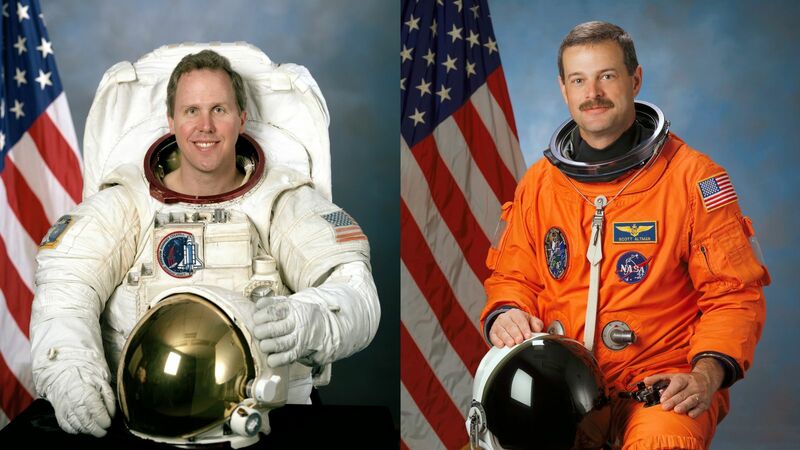 Joining the other 95 astronauts from the Mercury, Gemini, Apollo, and Space Shuttle Programs will be Space Shuttle astronauts Thomas Jones and Scott Altman. This will be the 17th class of shuttle astronauts to be inducted into the Hall of Fame. Inductees to the U.S. Astronaut Hall of Fame are selected by a special committee of the Astronaut Scholarship Foundation. Jones graduated from U.S. Air Force Academy and served on active duty as an Air Force officer for six years. Selected by NASA to be an astronaut in 1990, he first flew on Space Shuttle Endeavour in April of 1994 and again in October of 1994. In 1996 he flew aboard Columbia and flew his final shuttle flight in 2001 aboard Atlantis. Over four flights he accumulated a total of over 52 days in space, which included 3 spacewalks totaling more than 19 hours. Altman served in the United States Navy beginning in August 1981 and received his Navy wings of gold in February 1983. He flew many aircraft for the Navy including the F-14A Tomcat. He attended and graduated from the Navy Test Pilot School and has logged over 7,000 flight hours in more than 40 types of aircraft. After joining NASA in March of 1995, Altman first flew as the pilot of Space Shuttle Columbia on STS-90 in April of 1998 and then flew his second mission in September of 2000 as the pilot of Space Shuttle Atlantis on the STS-106 mission. He then served as commander of Columbia on the STS-109 mission in March of 2002, which serviced the Hubble Space Telescope for the fourth time. Altman’s final shuttle flight was STS-125 in May of 2009 serving as commander of Space Shuttle Atlantis performing the final Hubble servicing mission. During his four flights he spent over 51 days in space. The induction ceremony will start at 11 a.m. EDT (15:00 GMT) and will take place inside of the Space Shuttle Atlantis attraction in the main area of the visitors complex. The event is open to anyone who has paid for daily admission to the Kennedy Space Center Visitors Complex. Notable attendees will include over 15 astronauts including Apollo 7 Lunar Module Pilot Walt Cunningham, STS-1 Pilot Robert Crippen, STS-135 Commander Chris Ferguson and other notable Space Shuttle astronauts. Also in attendance will be the chairman of the Astronaut Scholarship Foundation, Curt Brown, a former astronaut flew aboard six Space Shuttle missions, and Kelvin Manning who is the associate director of Kennedy Space Center. The U.S. Astronaut Hall of Fame is contained inside the Heroes and Legends building at the Kennedy Space Center Visitors Complex. It was created by the original Mercury Seven astronauts and is a place where people can learn about the inductees and their missions.